Statistical Process Control (SPC) is an effective method of monitoring a process through the use of control charts. Control charts enable the use of objective criteria for distinguishing background variation from events of significance based on statistical techniques. Much of its power lies in the ability to monitor both process center and its variation about that center. In addition to reducing waste, SPC can lead to a reduction in the time required to produce the product or service from end to end. 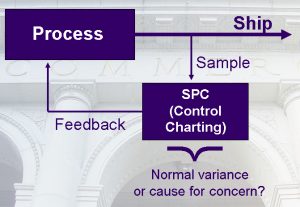 As Statistical process control involves using statistical techniques to measure and analyze the variation in processes. Most often used for manufacturing processes, the intent of SPC is to monitor product quality and maintain processes to fixed targets. 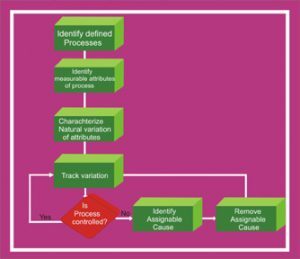 Statistical Process Control (SPC) can be applied to software development processes. A process has one or more outputs, as depicted in the figure below. These outputs, in turn, have measurable attributes. SPC is based on the idea that these attributes have two sources of variation: natural (also known as common) and assignable (also known as special) causes.